What it’s supposed to be: John Ford’s John Wayne western about three bank robbers who get chased into the desert, losing their horses and water but ending up with a young baby to care for as they struggle against the elements and try to stay one step ahead of the law. Why it’s a Christmas movie: It’s Christmas Eve, one character reminds another. 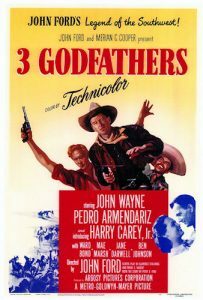 But not until over three quarters of the way into the movie, and by then the three bank robbers have already likened themselves to the three wise men after a Bible randomly opens to a verse about traveling to Jerusalem. And then they follow a star. And then John Wayne rides a donkey with the baby into town Christmas Eve. He stumbles into a tavern shooting “merry Christmas” with the baby in his arms. Thoughts: Beautifully shot, this western swings between action movie and comedy and tragedy and drama. But it does so adeptly, without missing a step. It feels natural because it’s all character driven, not plot driven. Although there are some moments where things happen “coincidentally”. The characters find themselves in the right place at the right time. The Bible they happen to find also happens to give literal direction to the characters. Ultimately, the baby brings change and redemption to the bank robbers and the Christmas connection that comes from movie is also natural thematically. Is It Naughty or Nice? John Wayne and John Ford? There’s only one complaint someone could give this movie: it’s a little too neat and tidy. But that’s part of the point of the thing. Your verdict? Let me know below in the comments! Ordering things from Amazon after clicking the links doesn’t add anything to your cost, but helps Strangers and Aliens and our operating costs! Thank you! Strangers and Aliens is a participant in the Amazon Services LLC Associates Program, an affiliate advertising program designed to provide a means for sites to earn advertising fees by advertising and linking to Amazon.com.